I feel like I’m always telling you guys about how I love to eat locally – whether is buying local produce at a farmer’s market or going to a local restaurant (instead of a dreaded chain). But I also love DRINKING locally! It’s probably a trait I got from my dad. I remember when we were kids and go on vacation, he would always ask for a local beer wherever we were having dinner. It’s a way to experience a place and try something new at the same time! Here in Nashville, we have a few local breweries, like Jackalope and Blackstone’s, but my absolute favorite beer in the world comes from the Yazoo Brewery (conveniently 2 miles from my house). I love hanging out at the Brewery on Saturday afternoons, getting some great eats from a local food truck parked outside, and just enjoying the company of my friends as we sit around, almost suspended in time from the outside world. It makes me happy. 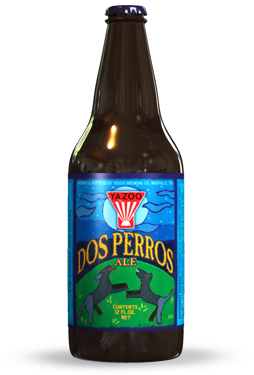 Well, the other day, I had a growler of Yazoo’s Dos Perros – one of my favorites. And I got some pork belly (which is essentially uncured bacon!) from my friend, Doug, at Walnut Hill Farms. Consider that may have been the only thing in the fridge, I just decided put them together….after I poured myself a glass, of course! Dos Perros means two dogs in Spanish and this beer is actually named after the brewmaster, Linus Hall’s two dogs. All the beautiful artwork is done by Linus’ wife, so it’s an all around family business! I slowly marinated the pork belly in the beer (and you really could use any beer you have on hand or some wine), and then braised it low and slow in the oven for a few hours. As with any great braise, you always want to strain the liquid/sauce from the braise and put it into a pan with the meat and reduce the sauce until it becomes an amazing glaze. That’s what separates a good braise from a great braise to me. Since pork belly is a pretty fatty cut, I don’t recommend eating a 2 lb. portion, because it’s so rich – but putting some fresh vegetables on the plate really helps cut through the richness of the pork. These gorgeous vegetables are from my CSA – some excellent fresh carrots, and three different kinds of beets (red, yellow, and chioggia – the multicolor ones). I’ve been eating them every day. Marinate the pork belly with the beer overnight. When you are ready to cook, take the pork belly out of the marinade and pat dry with paper towels. Put a pan over medium low heat and add the pork belly. Allow the fat to render from the pork belly, and pour out the fat when there is a substantial amount. You will end up cooking the pork belly for about 15 minutes, until it becomes beautifully golden brown on both sides. Remove the pork from the pan. Crank the heat to medium high and add the onion, carrot, and celery. Season with salt and cook until translucent. Add the apple, garlic cloves, and thyme, and let everything soften and become extremely aromatic. Put the pork back into the pan and add the beer from the marinade and the chicken stock. The liquid should come about 3/4 up on the pork. If you don’t need all 2 cups of chicken stock, you don’t have to use it. Put in a 325 degree oven for about 2- 2 1/2 hours, when the pork is just falling apart. Remove the pork from the oven and put the belly in a 8×8 pan. Strain the vegetables out of the sauce and pour the strained liquid over the pork belly. Cover the pork with plastic wrap and cover that with a smaller pan that has some heavy cans or a brick in it. The idea is that you want to press the pork belly in order to compress it and squeeze out some extra fat. Let that happen overnight. When you remove the weighted pan, the fat will have solidified and you can scoop that off with a spoon. To reheat the pork, slice it up and put it in a saucepan. Cover with some of the sauce and let reduce on medium heat until the sauce is the consistency of a glaze and the pork is warm throughout. 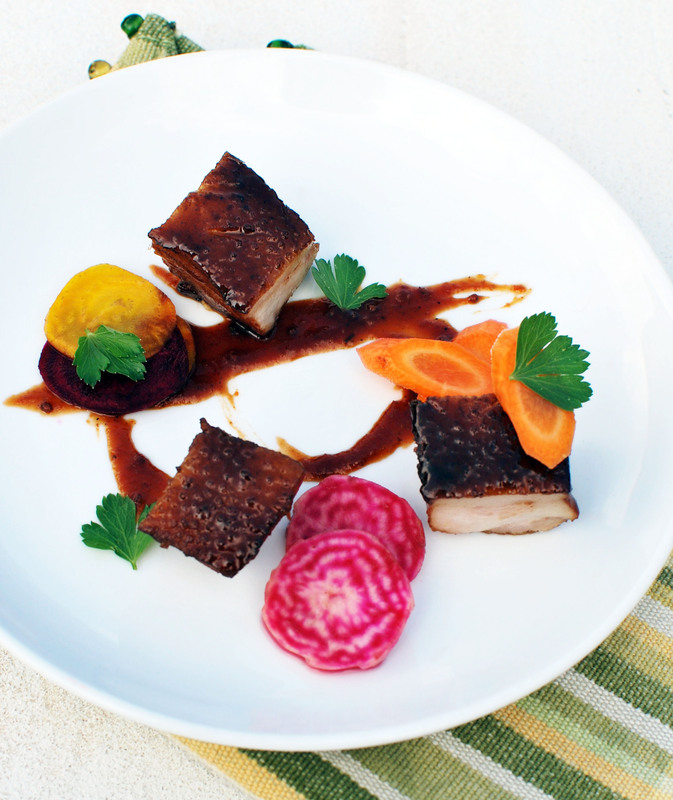 To serve, put some of the glaze on the plate and put some pork belly around the plate. Season the beets and carrots with some salt and pepper and scatter around the plate. Garnish with parsley leaves and some lemon zest and you have one fantastic dish! ← Gulf Shrimp with Toasted Garlic Pickled Jalapeno Vinaigrette and Nashville’s newest FRESH seafood purveyor! Where do you get your pork belly? Locally? Hey Blake! I do get it locally! This one is from Walnut Hills Farm in Bethpage, TN. Other good vendors are Emerald Glen Farms and Wedge Oak Farm which you can get at farmers markets. omigoodness, that looks just to die for! i will have to look for that beer around town and definitely try this recipe. thx for sharing! Thank you! And hey, if you can’t find dos Perros, try your favorite beer! Stouts also work great! mmm, pork belly. per usual, your plating is absolutely stunning. lovin’ this recipe!